Finally, India is making it easier for tourists to visit this incredible country! If you’re from one of the 74 countries highlighted on the map or listed below, now there’s no need to apply for an Indian tourist visa weeks or months ahead. With a minimum of 4 days and a maximum of 34 days before you show up in India, you can go online, fill out the visa application form, upload your passport info page and passport photo, pay online and get an email confirmation. Print that out and bring it with you to the immigration officer when you land in Delhi and voila, you’ll be stamped in. Note that this is not a Visa on Arrival program. You have to apply online before getting to India. This is an e-Tourist Visa program. As I’m traveling and living on this motorbike, I’m also managing and publishing the travel story on my website. In the years leading up to this trip, along with preparation for the mechanical side of the journey, I also taught myself how to maintain the electronic and online side of such a journey. Being a one-man show on a modest budget, I’ve come across nifty tools that make online photo and video publishing a breeze, along with tips on how to keep your computer healthy. Here’s a review of the online and computer tools that I use to make my life easy as I publish this ride report from the back of a bike on a 11.6″ netboook. Everything listed below is free to use, except SmugMug. I use and am very happy with the service. On a trip like this, the photos are the real treasures that you’ll keep. Besides sharing the trip with others, it’ll aid the memory banks in the years to come. So, paying for a good photo hosting site makes sense. SmugMug offers unlimited storage and viewing bandwidth, which is important compared to free sites like photobucket since they might not show the pictures if too many people are accessing them per month. From the PC, I use the tool to make uploading a breeze. Since uploading speeds can be limited while traveling, I always resize before uploading for posts and use Light Image Resizer. When I get to a place with a good internet connection, I upload the full resolution pictures as a backup. I take photos from multiple input sources such as my point and shoot camera, the SLR and stills from the GoPro and since each of them has a unique numbering system, I use FileRenamer to do batch renaming of files, which keeps the data nice and tidy. I use ScreenHunter to take screen shots of Google Maps. >>For video, shooting with the GoPro produces .MP4 files that are not editable in Windows Movie Maker. So, I convert them with this nifty tool from Pazera into AVI files. Also, the latest versions of Windows Movie Maker are lacking some features from older versions, so I just stick to Version 2.6. To edit and mix the audio tracks for the videos, I use Audacity, a simple, yet powerful audio editor. Even if I’m not splicing an MP3 for a video, I still run it through Audacity to clean up the file. Since the risk of losing your laptop or damaging its harddrive are quite real on a trip like this, I use DropBox to backup all my important files online. You get 2GB for free and it constantly syncs any modifications you make. This amount of space is enough for documents and other important files. It’s also handy if you need to access some important documents from another computer. Privacy and security haven’t been an issue (been using it for over two years) and they’re a reputable company in the business. For browsing, I use FireFox and to backup and sync my bookmarks, I use Works great and handy to access bookmarks from a different computer. Xmarks was recently acquired by the quickly growing , another extension on my browsers (I also use Chrome at times) to store and sync logins and passwords. These are safe companies and I’ve had no breaches of data. Plus, I’ll take the slight risk for ease of access when my online time is limited and I need to get a lot of online things done. I use SumatraPDF, instead of Adobe Acrobat for viewing PDF files, since it is very lightweight. And I use BullZip PDF Printer to print PDF files of documents and webpages. Skype turns my netbook into a phone when I’m online and the rates are very reasonable. Besides being free to call other Skype users, it’s only US$0.02/min to call any number in the US and most other developed countries. I use it also to make calls to India at $0.09/min. The other good thing is that 1-800 (toll free) numbers are free, so calling the credit card company, if they put a hold, is not a problem. The call quality is very good and depends on your net connection. Netbooks come with a built-in webcam, so if your parents also have one, they’ll be thrilled to see your face now and then via free video calls. Since my online time can be very short at times, I use the desktop email client ThunderBird (from Mozilla) to download my emails from gmail, where I can read them later, respond and then send when I get back online next (like the good ol’ days of send/receive). is the only major email service to offer free IMAP access. Hotmail still does not and there’s a go around for Yahoo. I highly recommend using a basic Notepad program since it is very light weight. Before submitting any post or email, I always copy and paste it in a notepad file, just in case something happens and you lose everything you just typed. Don’t let it happen. Even if you don’t save, just Select All (Ctrl A) and Copy (Ctrl C). This will store the text in memory until you copy something else. CCleaner is a useful tool to run every few weeks to clear waste that builds up in the background as you’re browsing. It keeps things tidy and helps keep Windows from bogging down. I’ve been using a netbook from Gateway (which is now owned by ). The ec1803u has worked flawlessly on my trip, so far. Screen: 11.6″ which is actually very livable with (considering I had a 24″ monitor before). More important than inches is resolution and this is tied to the kind of processor you get. My resolution is 1366×768, which is not bad in terms of website scrolling, video and photo editing, etc. I read websites in fullscreen mode to maximize my screen real estate; press F11 to get you there. Processor: Intel Core2Solo 1.4GHz. This pc is at the high end of netbooks and I chose this processor over the lightweight Atom since I wanted the ability to process and edit videos for which you need faster processors. But the downside is battery life. I get 4 hours at most, while an Atom-based netbook will get around 8 hours. So, if you don’t do any video editing, stick with the Atom. Memory and HardDrive: get the maximum you can afford. This pc comes with 2GB DDR2 and a drive with 250GB, which is pretty good. Operating Systems: the pc came with Windows 7 and it’s been running without a hitch and is quite nimble compared to Vista. However, I like options, so I’m triple-booting this pc with ubuntu (linux) and Windows XP. I keep XP around since it’s still a solid performer and I made an ultra light-weight version of it using nLiteOS. It’s a backup OS incase something compromises Win7. Click here for my triple-booting method. Data Management: I partition my hard drives (using Grub in ubuntu) and store all my data separate from the paritions with the operating systems, so that if something corrupts an OS, you can still access your data from another OS. I’m carrying 2 external hard drives for redundant backups of photo and video files. I’ve had good success with Western Digital’s Elements Portable series. I looked into paying for web hosting, but decided to stick with a free service that is more reliable. My website is a blog from Google’s Blogger. It has an easy to use interface for publishing on the go. I chose Blogger over WordPress, because it offers full customization for free. Hey, I’m cheap. I’ve edited the CSS to clean up the look and add in additional features such as the drop-down menu, image englarger and other features in the sidebar. It’s not hard to do since there are easy tutorials for everything (just google it). I’m also posting to facebook, a facebook page for the trip and to twitter. To manually update everything would take up too much time, so I use the broadcast services of Ping.fm where once I link up all my accounts (blog, facebook, twitter), one post from there will update all the selected accounts. You can send a message from your email to your ping.fm account and it’ll publish to all the sites. This was highly useful for sending updates from the text only email system of the Grimaldi ship. Too bad it can’t post to forums, yet. I use Cooliris to create the slick photo galleries. This works nicely even on slow connections. Only downside is the inability to arrange the photos on the wall. If you have questions about specific features on my site, let me know. for shortening URLs. Nice feature is that it lets you create a custom shortcut, like http://bit.ly/advjgs so it’s easy to remember what I have to type in to quickly get to my ride report thread to post an update. Since I left the US, I don’t have a phone number there anymore, but credit cards and other services still need to get in touch with you (for fraud alerts, etc), so setting up a free number at Google Voice allows anyone to call and leave a voicemail. Plus, from there, you can send free text (SMS) messages to any number in the US. Google Docs is a handy tool if you’re online all the time, since you can only access and edit when you’re online, so DropBox does the job now. Maybe with the rollout of HTML5, offline services will improve. Google Translator works like a charm for communicating with your new friends in a different language. Speaking is one thing, but writing nice sentences takes much more time to learn. Boulter.com/GPS for converting GPS coordinates into the correct format for GPS devices. You can grab a decimal coordinate from Google Maps by right-clicking and selecting “What’s Here” and then plug that into the calculator on Boulter.com and you get a coordinate that Garmin likes. Here’s another GPS converter from the FCC. Amazon.com’s Cloud Drive offer 5GB of free storage with the maximum file size of 2GB, making it easy to send massive files between travelers (like GPS maps, etc.). Portable Apps.com is supposedly the best way to ensure data protection when moving between different computers, but I haven’t used it yet since I’m connecting via my own netbook most of the time, even in internet cafes, where most likely they can give you an ethernet connection, if no WiFi. Using your own netbook is much safer than random computers at internet cafes, where there might be keyloggers storing your usernames and passwords. I don’t any access any financial sites from public computers. The Carnet de Passage is not that big of a headache as people make it out to be. It is a serious piece of paperwork, but pretty straightforward. 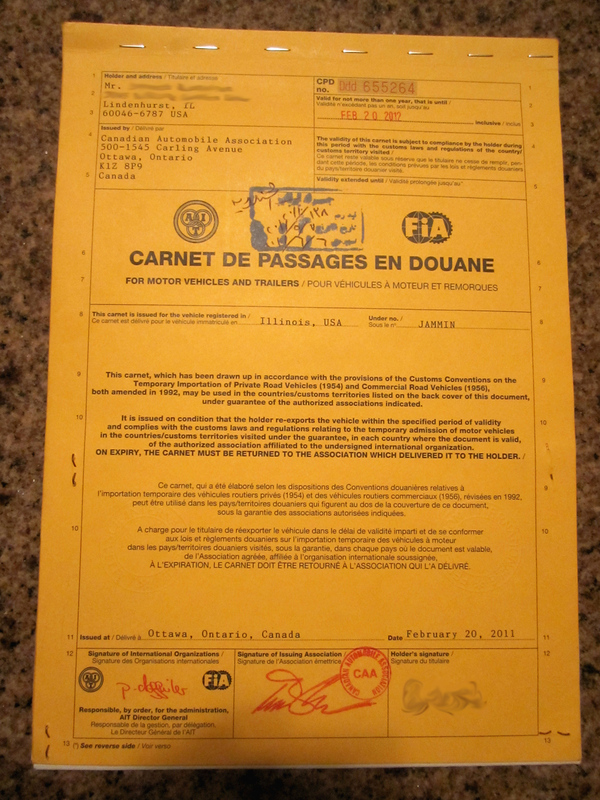 For US residents, you have to go through the Canadian Automobile Association since the AAA is not a member of the FIA, so they can’t issue the carnet, which is an official FIA document. You have to deal with Suzanne Danis ([email protected]) at the CAA who is top notch. She is very responsive and helpful and knows all about overlanders. I think Grant Johnson established the connection when they set about on their trip. You can apply for it all through email (scanned documents) and she will FedEx the carnet wherever you want. The Carnet de Passage cover. The fee for the carnet is $650 for AAA members or $100 more for non-members, so better to become a AAA member and get the discount. Get on the http://www.caa.ca website and use the carnet cost calculator to figure out your costs. Just to be clear – the point of the carnet is that the issuing auto club is telling the customs people of the country you visit that if you dont leave the country with your bike, that country can claim the import duty from the issuing club. In less developed countries, the import duties are usually more than 100% the value of the vehicle (to discourage foreign imports and protect local auto industries). Most countries in Africa are usually around the 250% mark and Kenya is at 500% and then Egypt tops the list at 800%. Iran and India are both at 500%. To get your carnet, there are two options based on the value of your bike and the countries you’re visiting: the indemnity (insurance) or bank guarantee. The indemnity is where you’re basically paying an insurance premium to cover the import duty cost of your bike but you only get back 43% of the premium you paid when you return your carnet. The other option is the bank guarantee, where you basically put aside enough money in a certain bank account to cover the cost of your carnet and you get back all of this, but there’s an additional fee that the bank takes of $2,000. I’m not sure how the bank guarantee amount is figured out but the minimum is $5,000 and for a bike valued at $10,000, you have to set aside $10,000 (depending on the country). My bike was valued at $1,400 and for my original carnet, which was for all the countries in Africa except Egypt, the insurance premium cost $540 and I would get back $232 on return. So, total cost after returning the carnet with the $650 fee would be $957. As you know, my plans changed and I had to add Egypt to my carnet. That changed the insurance premium to $1,209, with me getting back $520 on return with a total cost of $1,338. I paid the difference to the CAA and the French Auto Club in Paris amended my carnet (basically writing on it saying it was valid for Egypt). One of the reasons I went with an old, used bike was so that carnet wouldn’t be a deal breaker for Africa. Playing around with the cost calculator, it looks like for bikes worth less than $4,000, the indemnity works out as the cheaper overall option and for higher value bikes, the bank guarantee costs less. To get the value of the bike, I think the CAA determines it from NADA or something similar. I told them the bike was valued at $1700 when I bought it and now it was worth $1200, which they revised up to $1400. Using the carnet is pretty straight forward and the customs people know what to do (mostly). It is a booklet with 25 sheets. On each sheet, there are three sections, one for the import customs office, one for the export customs office and one for your records. 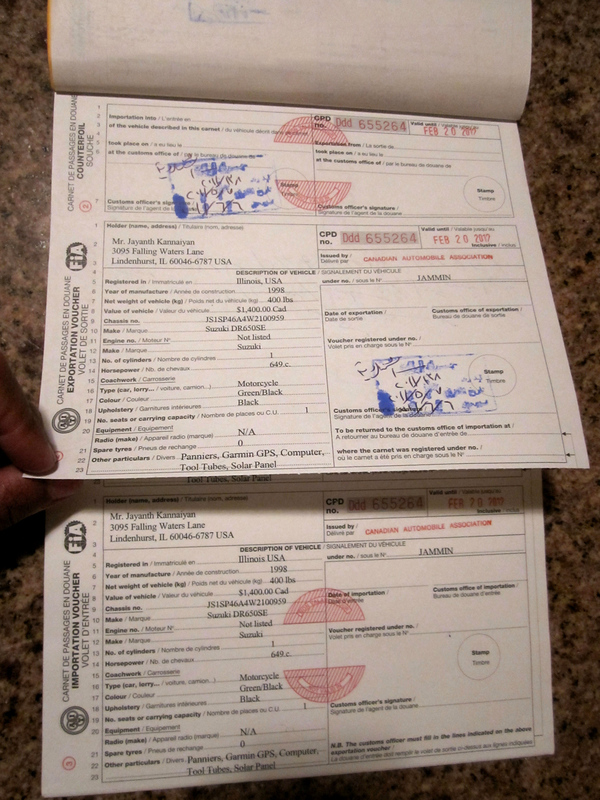 When you enter a country, the import customs has to fill out and stamp all three sections and they tear away the lower section for their records. When you leave the country, export customs has to fill out and stamp the middle section and the top section and then they tear away the middle section for their records, leaving you with the top section with an import stamp and export stamp. This is crucial. When you return your carnet to the issuing auto club, all the stamps have to match up, so it’s up to you to make sure before you leave the customs office that all is in order. One page for each country. The bottom part of each page is torn off when you enter, then the middle part is torn off when you exit and the top is your copy and proof of entry and exit. More and more countries are moving away from the carnet and issuing their own temporary import document, like all of the Americas (except Brazil when you enter by ship). However, the less developed countries are still clinging onto it, which is mostly in Africa, the Middle East, still India and countries like South Africa and Australia, who I think just love the bureaucracy they inherited from the British. Luke and Nick made it up from South Africa to Djibouti without carnets (cause they bought expensive new bikes), so ask them for details on that. Also, on the ferry from Venice to Alexandria, the papers the shipping company gave us indicated that you can enter Egypt without a carnet, but you’ll have to leave the deposit at customs when you enter and supposedly, you will get it back when you leave. I can’t say whether that’s true or not. I just entered my first country with the carnet and I’ll let you know if I run into any other issues. Here are a few charts to visualize some data. This is a comparison of the price of petrol in the countries of the Americas. I did not ride through Canada or Venezuela, but they’re just thrown in for reference and it’s fun to see the ‘free’ petrol in Hugo’s land. Europe is also shown just for comparison. This next chart shows how many kilometers (miles) were ridden on my trip through Latin America.